This article first appeared in Unlisted & Unlimited, The Edge Malaysia Weekly, on March 13, 2017 - March 19, 2017. In this challenging world of cheap, mass-produced, throwaway objects, Frou Frou Fine Jewellery’s Dorothy Jen Ng makes a case for handcrafted custom jewellery that can be passed on to future generations. 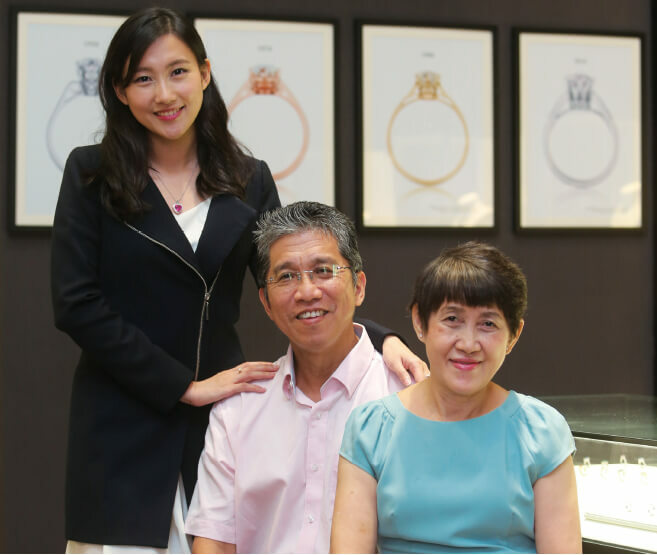 Dorothy Jen Ng is a third-generation jeweller, having inherited her father’s and grandfather’s passion for the business. She established Frou Frou Fine Jewellery three years ago in the hope of tapping a younger market from that of her father, Jude, who runs a quaint little jewellery shop in Chulia Street in George Town, Penang. Martin, who passed away three years ago, came to Malaya in the 1930s when he was still a teenager. He married early, as was the custom in those days, and found himself with a young family to support. They settled down in Alor Setar, Kedah, and he looked about for some means of earning an income. A romantic artisan by nature, he was drawn to crafting jewellery. “He never worked for anyone. He learnt the craft on his own by utilising various drilling tools, which only required a small sum of money. His clients were jewellery stores and sometimes traders commissioned him to make custom jewellery,” Ng recalls. She notes that unlike many of the Chinese who came over to Malaya at the time, her grandfather was extremely literate and even wrote poetry. He was very versatile and able to craft a wide range of jewellery. It was almost like a natural talent because he did not pick it up from anyone else. “After a while, people started calling him a master craftsman,” she says proudly. By the 1950s, Martin’s fame had spread and his clients included the Kedah royal family. Ng says the family still treasures the photographs of Martin attending a royal wedding as an honoured guest because he had designed and crafted the jewellery for the event. This design was much sought after in the 1950s. The diamond is set in what appears to be a crown with six or eight prongs. The crown diamond engagement ring has been a bestseller for many generations. This was a significant event for the family business. “It marked the beginning of our designs being influenced and inspired by the Europeans. We were no longer just a traditional Chinese goldsmith, but one that specialised in European fine jewellery,” she says. The Crown Solitaire series became the business’ signature series. But to Ng and her father, it represents nearly 70 years of the family’s history as jewellers. Understandably, they have a sentimental attachment to the series. Handcrafted jewellery is not something that brings in the big bucks because unlike mass produced items, it takes a lot of time and effort to make one piece. Martin, for instance, could only make 10 pieces a month. Also, the family was living in Alor Setar, so there was a limited customer base for fine jewellery. The family moved to Penang in 1974 and Jude, Martin’s second son, took up the craft. Interestingly, his father did not teach him anything. Martin’s philosophy was that if one had enough desire to learn, one would be able to pick it up on his own, just like he had. Jude started Kaejih Jewellers that year. He was in his early twenties at the time. Ng says her father is really passionate about making fine jewellery. “His fascination with gemstones is boundless. Even today, when he is not at his bench making jewellery, he is travelling around the world in search of gemstones and other materials for his creations,” she says. Jude’s jewellery pieces are popular among the Europeans and Australians who live on Penang island. He inherited his father’s ability to craft any piece of jewellery. Today, he is a master craftsman of everything from rings and bracelets to brooches and hairpins. Jude’s passion for crafting jewellery influenced his two brothers, who became involved with the business as well. Both brothers are gemmologists and one of them is also a geologist and currently based in New York. Jude has taken the original Crown Solitaire design to the next level. Today’s collection, known as the Crest of the Maison (literally translated: the pinnacle of the business), comprises various Crown Solitaire engagement rings, which are among the most recognisable and highly celebrated pieces of jewellery. Ng started Frou Frou Fine Jewellery when she was only 25. However, unlike her father, it was not a foregone conclusion that she would go into the family business. She tried other jobs first. “I like travelling. Being the host for a travel programme, 40urs, which is broadcast in Singapore, Hong Kong and China, gave me exposure and experience in the entertainment industry. I soon discovered that it was not my thing,” says Ng. Nevertheless, she spent three years doing that part-time while she studied gemmology at the Gemological Institute of America. When she graduated, she returned to her roots. “My late grandfather was a master craftsman all his life. My father has been in the business for nearly half a century. My siblings and I grew up speaking the language of gemstones and jewellers. While other children could recite the alphabet, we could recite the list of birthstones,” she says. Ng, the youngest of five children, has two brothers and two sisters. Only one brother and sister are currently involved in the business as the other two are not that interested. However, she is the only professional gemmologist in the family. Her sister oversees the business operations and manages the production line, workshop and material planning. Her brother, who is an IT enthusiast, has computerised the business and brought it into the 21st century. Ng’s mother, Jo Loo, is also involved in the family business. She was a kindergarten teacher before marriage. After marrying Jude, she learnt the ropes and became a jewellery designer. Today, she designs pieces for both Kaejih and Frou Frou. “My parents did not groom us to take over the business. They let us decide for ourselves. That is because they understand that you cannot force an interest. So, three of us are involved in the business while the other two are not,” says Ng. Succession planning is the most important part of any family business. Many of these businesses close down after a generation or two because the next generation has no interest in taking over. For Ng and her family, the question of a successor has not come up yet. She and her siblings can carry on for at least the next three decades. And like their grandfather and father before them, they will not force their children to take over the business. “We understand that people will not excel if they are not interested. If we have children, we will raise them the way our parents raised us. If they want to take over the business and continue the family’s legacy, that will be great. If not, we will find some other way,” she says. What is the most pressing issue in this industry? Ng says it is in hiring new craftsmen. Most of the craftsmen she knows have many years of experience, but there is less new blood coming into the industry. The youngest craftsman she knows is already in his forties. “I think the biggest challenge is that jewellery craftsmen are not easy to come by. They have to endure long working hours and commit a lot of time and effort to learning the intricate skills of crafting jewellery. And the returns are not as high as you would think,” she says. Just as in any other industry, machine-made products are slowly taking over. Some jewellery pieces are being crafted using moulds, while others are produced with 3D-printing techniques. Handcrafted jewellery, on the other hand, requires time, effort and skill. Ng thinks the new technologies can support mass production and will replace handcrafted products sooner or later. “It is very sad. Machine-made products are very cold in their absolute perfection. Everything is precise and just right. But the warmth of human touch is not there. You do not feel humanity in the piece,” she says. How expensive is it to make custom jewellery? “It costs a lot to do so in Europe. But in Malaysia, this is not the case. 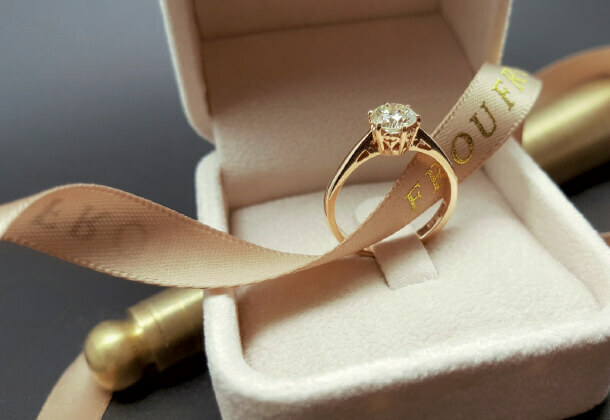 In fact, many are surprised that a custom-made gold wedding band at Frou Frou starts at RM1,500 while a silver wedding band only starts at RM500,” says Ng. For the Crown Solitaire series, the six-pronged ring starts at RM7,500 while the rare antique-setting eight-pronged ring starts at RM10,000. In this business, integrity and honesty are everything, says Ng. “The prices we quote include the cost of craftsmanship and materials and nothing else. We do not mark up the price to give a big discount later,” she asserts. How long does it take to make a piece? About two months from the time the client approaches Frou Frou to discuss the design to the delivery of the piece, says Ng. Clients are provided with personalised service and consultation so that the designer understands what they want and what their concerns are. “We provide the clients with information about diamonds and other gemstones as well as the possible designs. By providing these details, there will be less chance of them having buyer’s remorse,” she says. Her customers are mainly young working adults who are planning to get married. Even in an economic downturn, bridal jewellery is a necessary luxury. They are usually repeat customers or those who have been referred by existing clients. Nonetheless, many independent jewellers have closed down because people are cutting down on their spending. Also, Malaysians are more into ornamental accessories than real jewellery, says Ng. But it is quite different in Europe, where most women — and even young girls — wear and treasure their jewellery. In Malaysia, even wearing a ring calls for a special occasion. “We should educate people that wearing fine jewellery creates a different vibe. Maybe if they were properly educated on the subject, they would have a different view,” she says. Another reason fine jewellery may not be as popular in Malaysia is that people do not want to attract the attention of robbers. Frou Frou saw healthy quarter-on-quarter growth of 20% to 30% last year. That is why Ng is opening another private showroom in Kuala Lumpur, just a year after she opened one in Penang. Customers need to make an appointment to visit these showrooms. This allows them to interact with the jewellery designers in a more private setting so that their needs are understood and the jewellery can be designed accordingly. The private showrooms are part of Frou Frou’s endeavour to take the jewellery business to the next level. Ng believes there is still a place for jewellery in a family’s legacy. “I think people are less into sentimental heirlooms nowadays. These are being replaced by property and assets that have more liquidity,” she says. That is why Frou Frou specialises in quality and timeless designs that people can wear for the next 50 years or more. And while there are plenty of jewellers in the market, Ng does not think Frou Frou or Kaejih have many competitors because a lot of the other businesses are doing mass or casting production and are not in the handcrafting business. After expanding her business to the country’s capital, she has set her sights on the other major cities in Malaysia. At a later stage, she will look at expanding overseas. Today, Frou Frou receives orders from countries such as the US, the UK and Taiwan. Ng feels her family business is like a castle and her family is holding up the ramparts in this challenging world of cheap mass-produced throwaway objects. But she will not give up without a fight. “I remember my father saying that fine jewellery is for people who appreciate the arts and nature. I would say, they are also for people who value sentiment. These are the ones who will buy and treasure such things. And we will continue to make our jewellery for them,” she says.